2 large organic apples – left the skin on and just sliced to match the size of the pears. I used a 8×8 casserole with a glass lid. Put the chopped fruit in the casserole and squeeze lemon juice over the fruit and sprinkle sweetener on top – mix it up with a spoon. 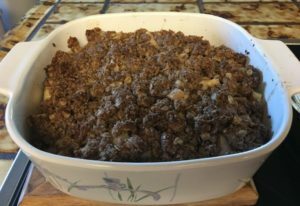 For the topping, mix all the dry ingredients, then pour the melted butter on them and mix until they’re all mixed up and make a crumbly topping. Crumble the topping over the fruit as evenly as you can. 350° oven for 30 minutes until lightly browned on top – Then I put the lid on and cooked for 20 minutes longer to make sure the fruit is nice and soft. 50 minute total cooking time. Cool and enjoy with some cream poured on top, or a bit of whipped cream or ice cream. Yum!